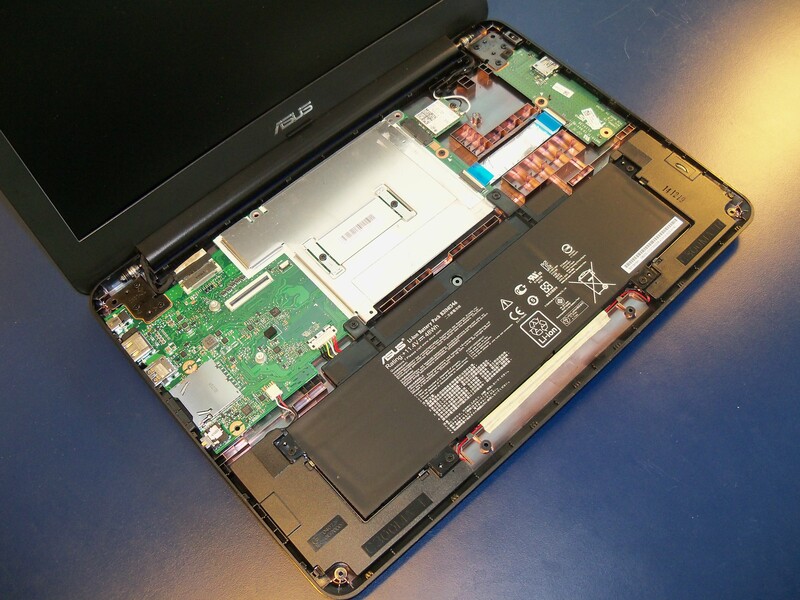 I bought the Asus C300 Chromebook this summer because it's a low–power, long–lasting, lightweight laptop that I can throw in a small backpack and carry around all day. But as a Linux/BSD user and someone who doesn't have Internet access during trips, I didn't buy this machine to run Chrome OS. Thanks to the work of John Lewis this year, the C300 can (more easily) be modified to run a community Linux distribution. Because running Linux on the newer Baytrail Chromebooks is relatively bleeding edge, I wanted to put some documentation on the web. So when I cracked open the case to remove the write–protect screw, I took the camera with me. Below, I've picked out the interesting pictures for someone who wants to look inside. I've also quickly explained why we need John Lewis's alternative firmware, how to use it, and where to get it. Then at the end I have a short list of issues/fixes you'll like to know about. The top half (where the keyboard and trackpad are housed) is mounted to the bottom half by a number of screws and internal plastic retaining clips. The screws are removed from the bottom with a phillips head screw driver. The clips are freed by wiggling a flat thin object between the top/bottom halves. The retaining clips are fragile, and I broke about three of ten. I had to reopen the case to remove the broken clips, because they were rolling around inside. 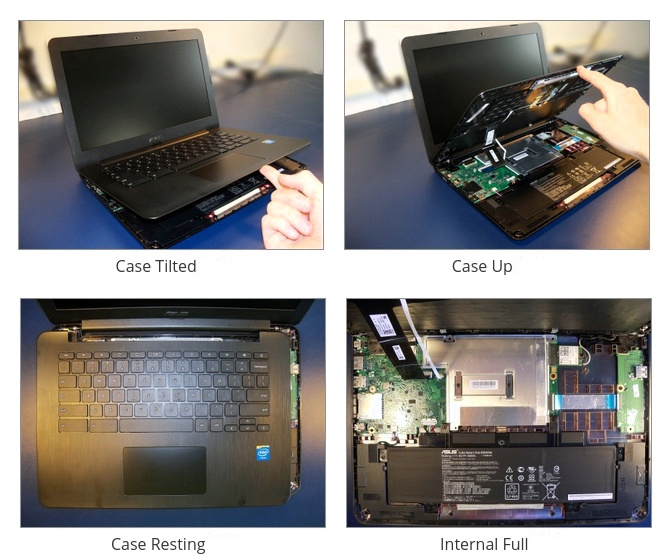 In order to move the top half of the case away, the keyboard and touchpad ribbons can be detached from the motherboard. I wouldn't recommend removing any ribbons though, because these connections are fragile. For example, if you're removing the write–protect screw, that can be done without detaching any ribbons. The motherboard is about 35% the size of the case, which is less surprising after seeing how large the battery is. I'm assuming the CPU is underneath the largest metallic cover. There is no fan. 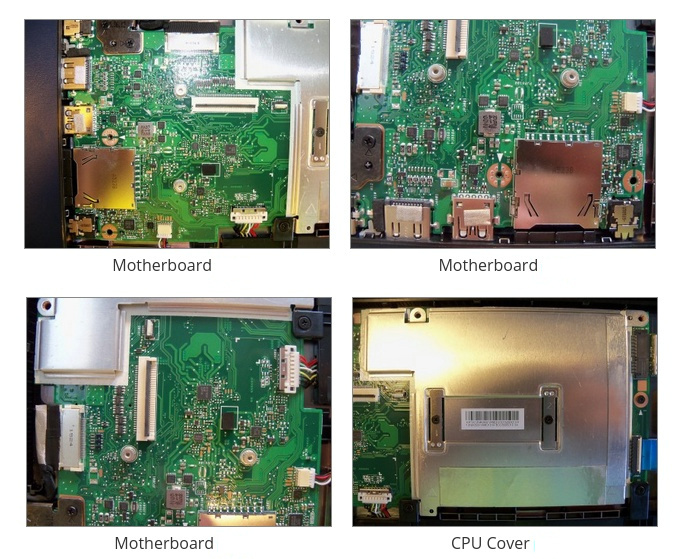 Besides the motherboard, two additional circuit boards are visible. One board houses external I/O ports on the right side of the case. The other board houses connectors for the keyboard and trackpad. 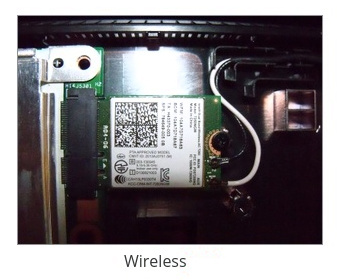 The wireless interface is a separate card located between the motherboard and the I/O board. 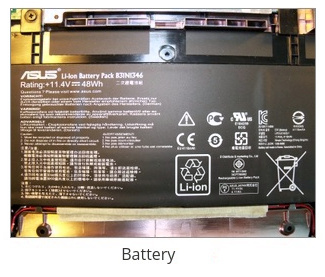 The battery and its housing are about 40% the size of the case. The combination of a high–capacity battery and a low–power processor gives a long endurance without AC power. 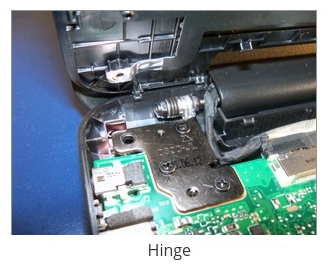 The mounting plate for the screen hinge is large compared to other laptops I've seen. This makes the hinge more resistant to coming loose. 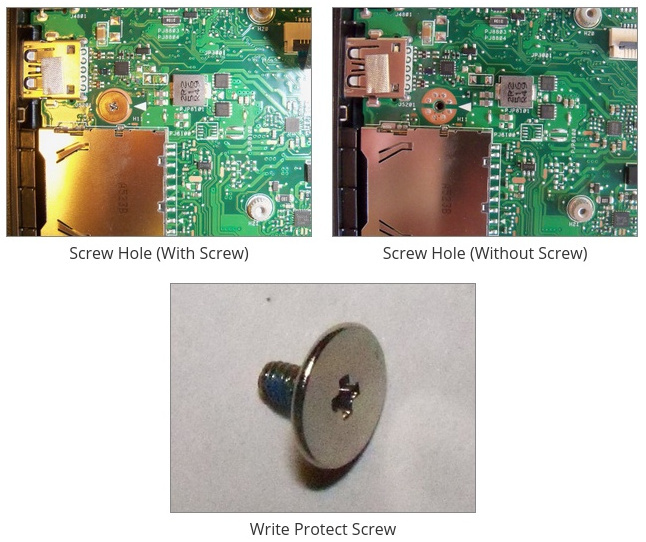 The firmware write–protect screw is on the motherboard, near the card reader and USB port. There is a white triangle next to the hole. The screw has a large, flat, silver, head. The C300 ships with Coreboot and U-Boot configured with verified boot. If you want to boot an OS besides Chrome, it's a lot of extra work to use Coreboot/U-Boot as is, because the kernel has to be re–signed every time it is changed. The easier alternative is SeaBIOS, which boots from a disk just like a conventional PC BIOS. Lucky for us, in mid 2015, John Lewis released firmware builds with SeaBIOS payloads for the Baytrail Chromebooks (including the C300). I've linked to his site below. Please do your homework and read everything there before using, because there are some issues. Realize that by opening the case and writing the firmware, you are certainly voiding the warranty.